A week ago last Saturday was a momentous occasion. Reflecting on it now, the surprise and elation is still as present as it was then. 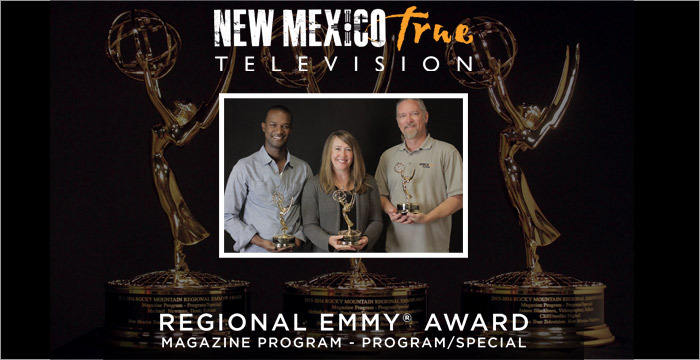 On October 8th, the NM True Crew won Regional Emmy® Awards for our work on New Mexico True Television, the series garnering the award in the Magazine Program category. I know we have earned this. I know the pride I feel in the show. I know the many people, places, and stories we have shared deserve this. But it still humbles me. And it still feels surreal. When the show first started, I felt undermanned and short of resources. And crafting six shows in the time allotted for our pilot season was a serious challenge, to say the least. But we did it. And CliffDweller Digital was contracted to do another season. And it kept going. We're still doing it today, nearly three years later. Even three days ago, when we arrived onsite for a shoot, the locals couldn't believe there were only three of us in the field. They expected at least 15 people. And while at one point I felt undermanned, today I feel like we have the perfect unit. I love my team. I truly believe it is our unique dynamic, our work ethic, our passion for what we are doing, and the relationships we have formed in every corner of this state, that have contributed to our success. Beyond the ‘NM True Crew’ – Michael Newman (host, editor), James Blackburn (videographer, editor), and myself – we have been fortunate to pull on the support of the rest of the CliffDweller Digital team. We would not be where we are without them. Sharing in this achievement are Dan Schueler (an integral part of our editing team), Heather Holcomb, Richard Holcomb, Janine Sjostrom, Chuck Tjeltweed, Cindy Melo, and Alf Barreiro. With the continued support and encouragement from the New Mexico Tourism Department, particularly Cabinet Secretary Rebecca Latham and Video Services Manager Dan Monaghan, the show has not only grown, but flourished. We hope our best episodes are yet to come. And while the Regional Emmy® Award serves as a wonderful affirmation of our success, one which we undoubtedly will relish the rest of our days, our biggest success has been to keep this show going. We are still churning out show after show. I think I speak for our entire CliffDweller team when I say this. And thankfully we live in a state so beautiful, so diverse, so rich in history and culture, we have endless content and opportunities for storytelling. This is also our reward. The statuette standing on my desk is the visual reminder, the tangible symbol we are not only doing a good job, but an exceptional one. And I am so grateful to have this validation. Being recognized for your work is a powerful thing. It is a testament to what can be achieved when you put your heart into something, and you believe in yourself, even when it seems everything is stacked against you. When I first shared the news to everyone back at CliffDweller Digital, emailing them from the ceremony, all I could say is "We won! Beaming." And nine days later, I'm still beaming. I think I will be for a while.